Make ahead ready for your holiday gatherings. 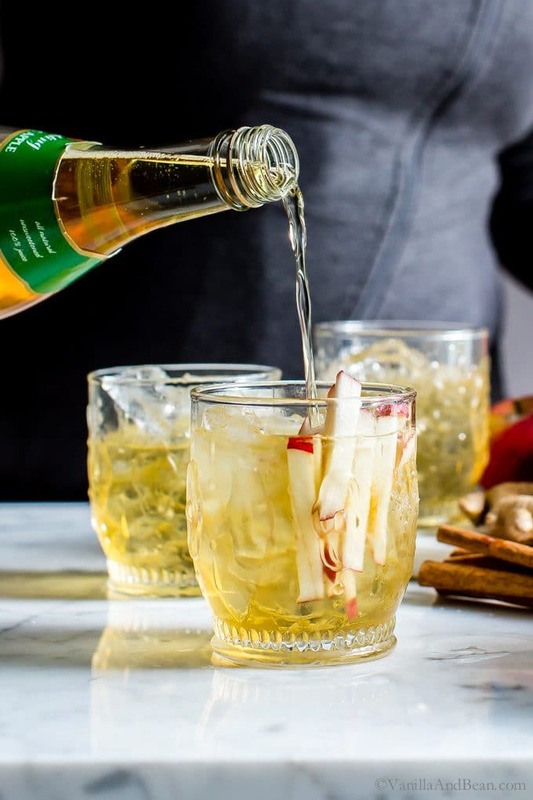 Refreshing, festive and easy: Sparkling Apple Bourbon Sangria with a hint of ginger and cinnamon. It’s go time! Are you feeling prepared? 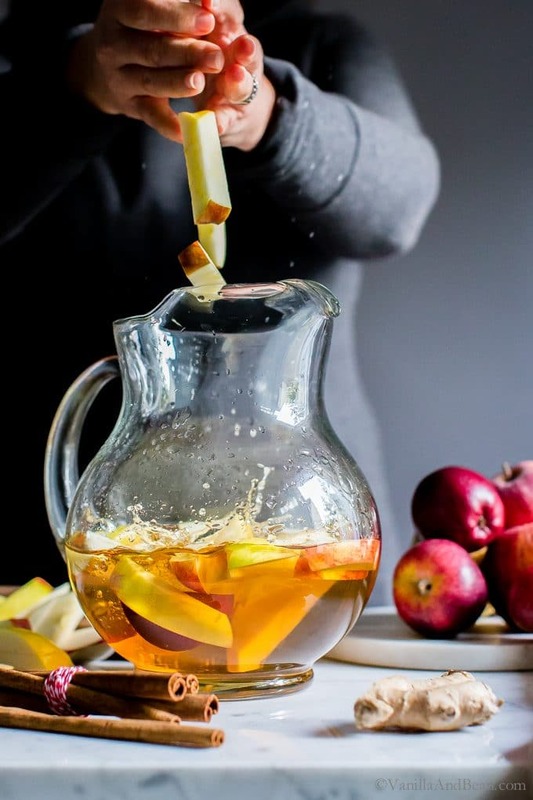 The holidays are upon us so a pitcher of Sparkling Apple Bourbon Sangria is in order! New to sangria? It’s easy peasy to pull together and tastes better with a little time to mingle in the fridge. It’s not just for summer. Sangria offers ready made cocktails that’ll help free your hands for other tasks like greeting guests, finishing up the Apple Dumplings, or for lazin’ on the couch enjoying appetizers. I’m partial to the latter, ahem. Sangria is a catch-all term for wine based, fruit filled pitcher cocktails that improve with time while hanging out in the fridge. 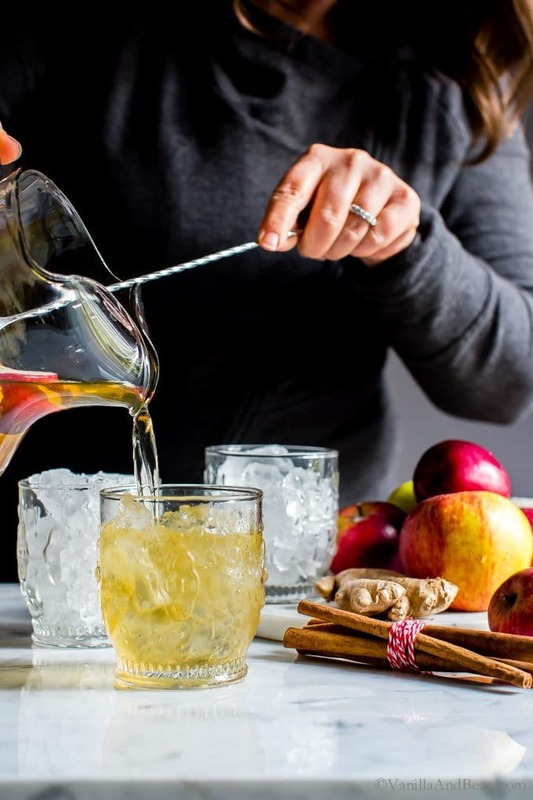 For this apple bourbon sangria, I’ve included white wine, a glug bourbon (okay, more than a glug), a bit of maple syrup, ginger and cinnamon sticks. 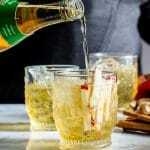 Top it off with sparkling apple juice for some festive bubbles. Bourbon’s caramel and vanilla notes completely win me over and they shine when paired with apples. Like peas and carrots, perfect partners in every way whether together in a cocktail, pie or cobbler. The combination just works. When it comes to cocktails, I’m particularly fond of refreshing cocktails, preferring icy and bubbly over the stronger, straight varieties. Never-mind the cold, windy, driving rain outside. Stress and being with those we love often need a counter balance. It’s hot in the kitchen anyway (or maybe on the couch too), so why not have a little sipper on the side. The adults in my life appreciate this nevertheless. It helps us all get along perhaps a little better during the holidays. One Sparkling Apple Bourbon Sangria recipe will serve 8-9 servings in low ball glasses. But of course sangria goes down easy, so double the recipe if serving more than four adults. Figure at least two drinks per person. It’s not necessary to get expensive wine for sangria. It’ll be mixed with other flavors. This is my favorite chardonnay. If serving right away, add the Sparkling Apple juice directly to the pitcher of sangria. 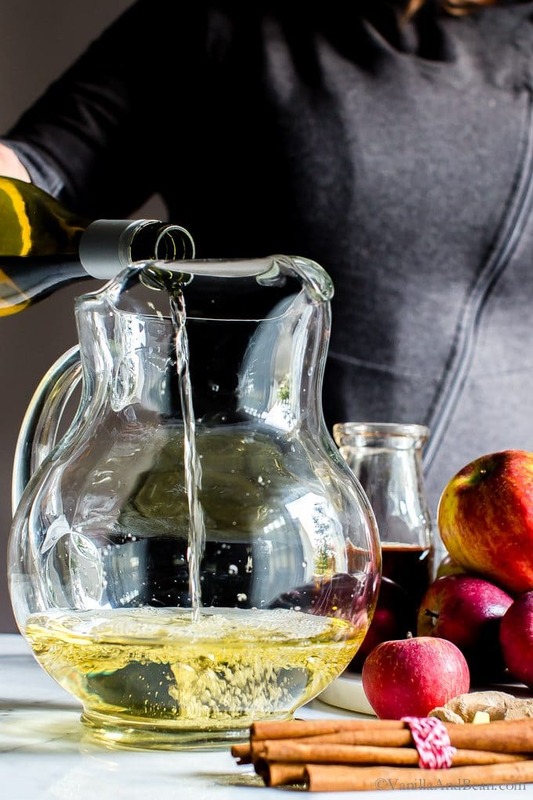 If serving as singles, hold off adding the Sparkling Apple to the pitcher and instead, top off each glass individually. The cinnamon comes through more so after at least 8 hours of refrigerator time, even more on the second day. So if you have time, make this at least 12-18 hours in advance. 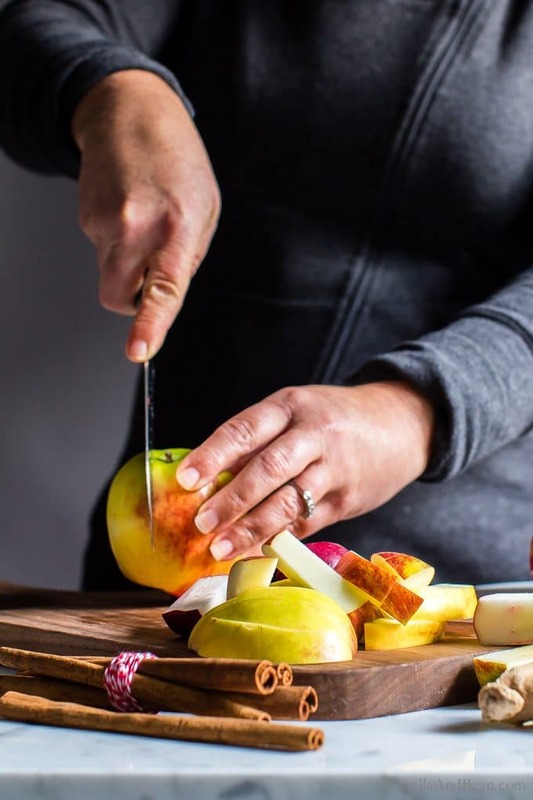 Due to the sugar content of this recipe, the apples stay crisp and hold their creamy white color for at least 8 hours – so don’t worry about that! Their flavor improves with time too! Are you hosting, taking, or going out? Sending my best for a festive and beautiful (and low stress) Thanksgiving! Remember the three Cs: Calm. Cool. Collected. 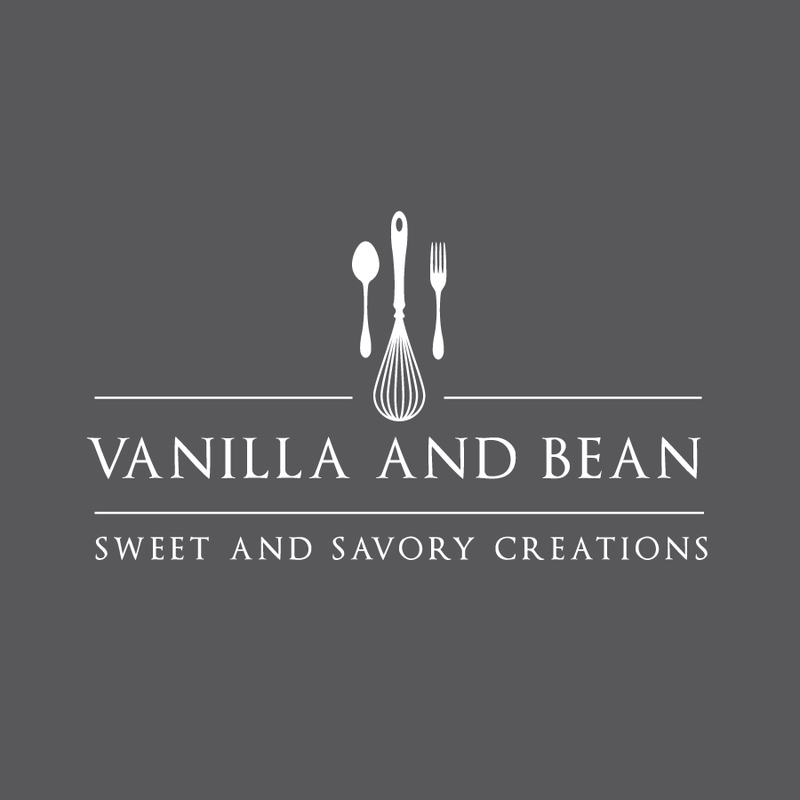 Make ahead ready for your holiday gatherings. 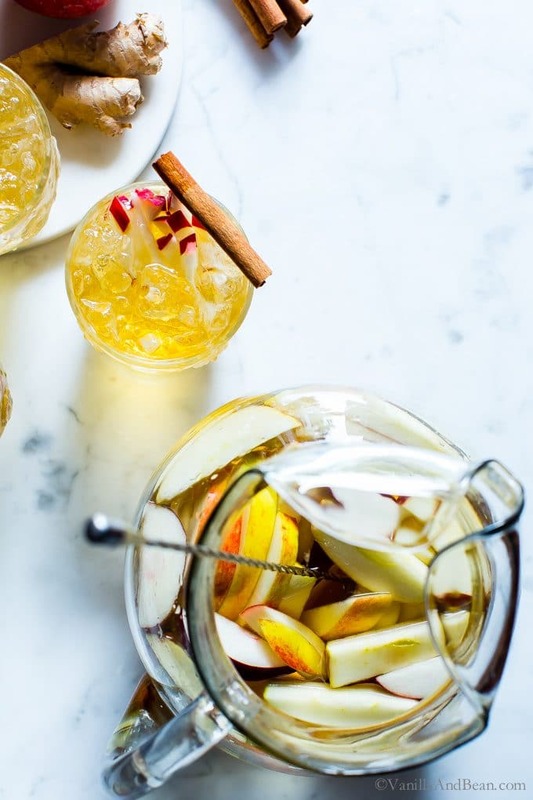 Refreshing, festive and easy: Sparkling Apple Bourbon Sangria with a hint of ginger and cinnamon. *Servings are for low ball glasses. This recipe doubles with ease! *Time below does not include time for resting the sangria. 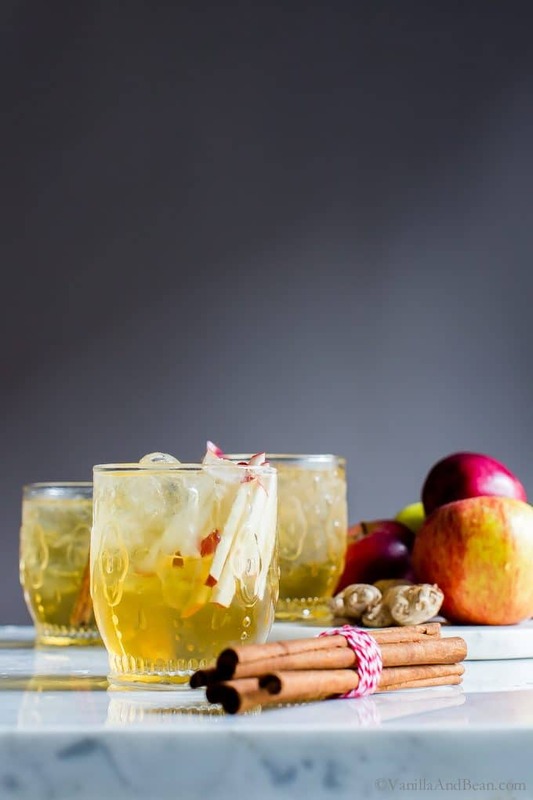 In a pitcher or large jar, add the chardonnay, bourbon, maple syrup, cinnamon sticks, ginger and apples. Stir to incorporate flavors. Cover and chill for at least two hours or up to 24 hours. 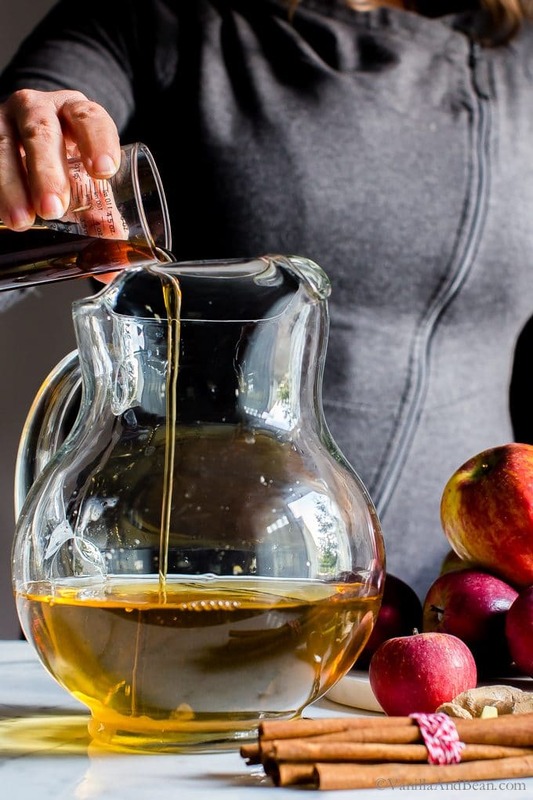 Just before serving, pour the sparkling apple juice in the pitcher or individually to top off low ball, ice filled glasses. Garnish with sliced apples sticks (sliced on a mandoline - french fry setting). Snack on the leftover apples! 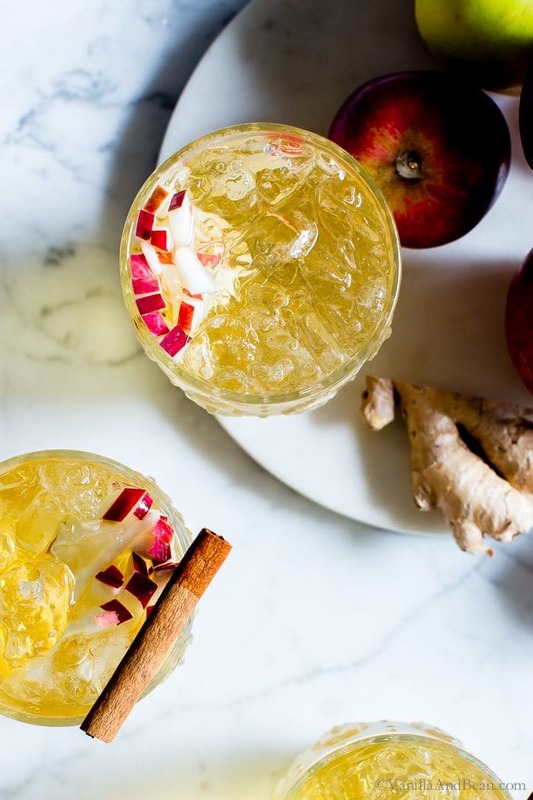 So pretty – the perfect seasonal drink! Ok, it’s settled. I’m coming to your house for Thanksgiving next year! Everything you prepared looks unbelievable, including this flavorful sangria. I’m obsessed with these photos too. The light, the action shots…somehow you continue to outdo yourself every time. Beautiful work, Traci. I hope you had a wonderful holiday! This is an awesome beverage recipe, Traci! My mouth is watering right now. Can I use honey instead of maple syrup? Hey Agness! Thank you for your note… honey would be a delicious sub, but add to taste. I hope you enjoy the recipe Agness! 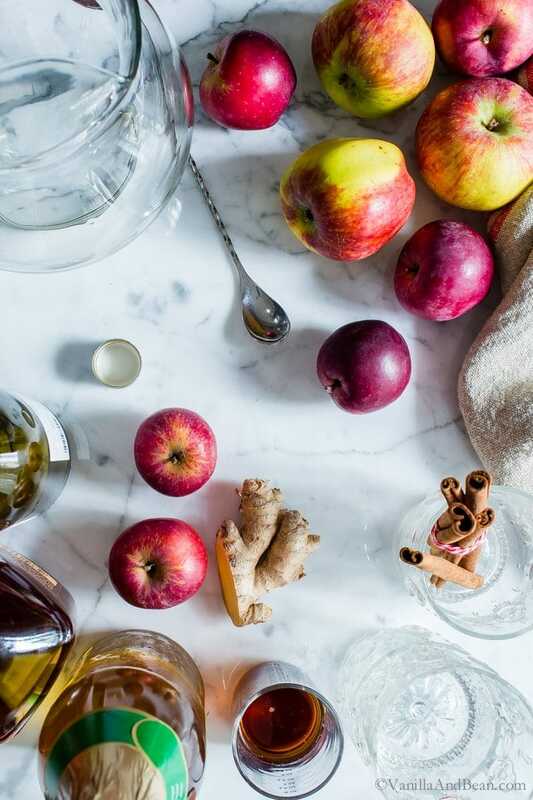 I bet this smells divine too.The apple and cinnamon and bourbon. GAH! perfecto my friend. 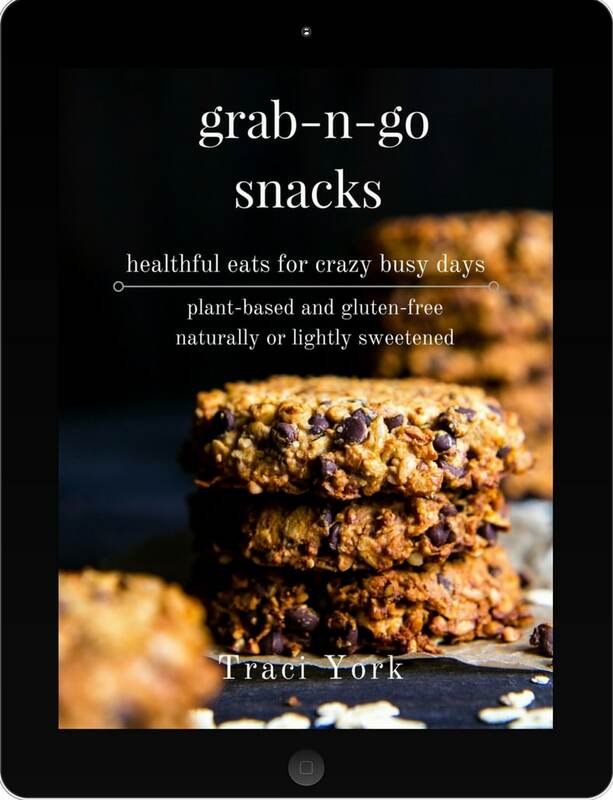 Yum – pour me a big glass, Traci! Beautiful shots all through this post! Wishing you and Rob a happy Thanksgiving – I am really looking forward to the 4 day break! You got it Geraldine! Thank you so much… and I hope you had a fabulous Holiday! xo The 4 day break couldn’t have come at a better time, right?! I love all of your big batch cocktails and this one does not disappoint! I can see this enjoying a prime spot on my holiday table! oooo this looks tasty. I like the fortification! Thank you Ben… we’re certainly enjoying it! You’re making me rethink my beverage choice now! I was going to do a mulled wine because we’re having Thanksgiving outside but it’s going to be in the 70s and you’re right, the cooks get so hot. I know I would prefer this refreshing chilled sangria to a hot beverage. Such a perfectly festive sangria recipe! Love the warm flavor profile of the spices contrasted by crisp apple, so tasty!